Arrive into Darwin domestic airport and transfer to your hotel. Rest of the day is at leisure. Overnight. We shall depart Darwin around 6.00 am for the short journey to Litchfield National Park. Explore the waterfalls, spring-fed streams and rugged sandstone escarpments of Litchfield National Park. Discover intriguing cathedral and magnetic termite mounds and swim, hike and explore Florence and Wangi Falls and enjoy a picnic lunch. After lunch we leave the highway behind and hit the dirt travelling along the Marrakai Road before joining the Old Jim Jim Road taking us deep into Kakadu National Park. Travelling past billabongs and traversing water crossings bringing ample opportunity for wildlife spotting. Arrive at lodge accommodation at Cooinda where we spend the night enjoying dinner and some stargazing. Overnight. Breakfast. 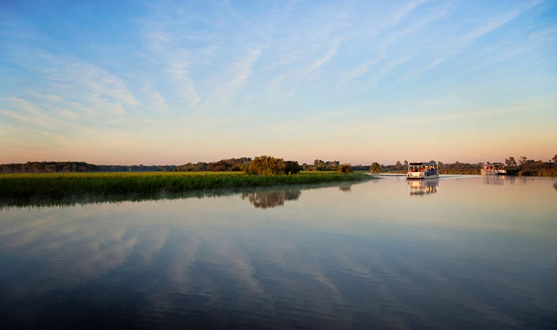 We start our day with the iconic Yellow Waters Cruise. A must do activity within Kakadu National Park, it is owned and centers on a spectacular billabong system that is home to some remarkable and diverse wildlife which is Aboriginal in its very essence. Spotting crocodiles is only one of the many wildlife viewing opportunities on this unique water system. Later this afternoon we arrive at the culturally significant Aboriginal art site, Ubirr, located within the East Alligator region of the park. Here you will view a wide range of ancient Aboriginal art which will be interpreted by your guide. Learn the story of the Rainbow Serpent and climb the Nadab Lookout for panoramic views over the floodplain and beyond into Arnhem Land. After learning about the area, it's time to pick out a quiet spot to sit while we watch the sun set over the Kakadu escarpment before making the short journey to your lodge accommodation for the night. Breakfast. 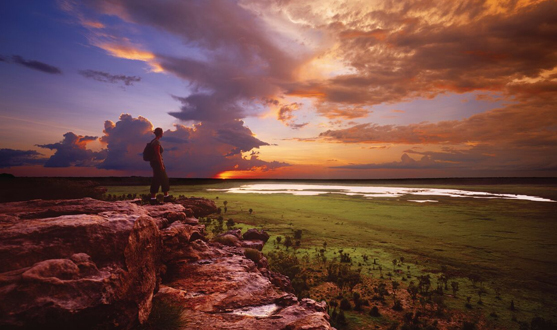 Today we explore the jewels of Kakadu National Park. Departing early, we travel to Twin and Jim Jim Falls*. Explore Twin Falls Gorge which is accessed by 4-wheel drive track, a boat shuttle service and a rocky walking track and boardwalk. Once there relax on the sandy banks and admire the falls. There's more 4-wheel driving as we make our way to Jim Jim Falls where a walk through monsoon forest and over boulders takes us to the waterfall and plunge pool which are surrounded by 150 metre cliffs. Spend the afternoon taking in the sheer beauty of your spectacular surrounds before we make our way back to our accommodation for our last night in the wilderness. Overnight. Breakfast. Today, a once in a lifetime experience awaits. Travelling into remote Western Arnhem Land you will witness Ancient Aboriginal Art brought to life by your indigenous guide at Injalak Hill. Take in the amazing views across the escarpment before travelling to the Injalak Art Centre where you say goodbye to your Indigenous guide and hello to some amazing art on offer or simply watch the indigenous artists at work. Travel back into Kakadu National Park before returning to cosmopolitan Darwin and tales of the day's adventures whilst reflecting on the profound effect this magical place has on people. We arrive back around 5.30 pm. Breakfast. 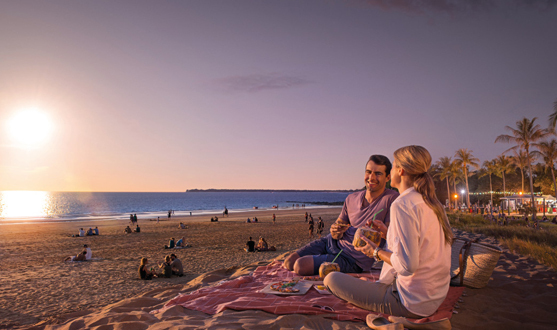 Departure transfer to the Darwin airport for your flight back home.